A few years back, I was blessed with a talented piano student that was also a stellar brass player. She helped me pick out a trumpet for Natter, and gave him a few lessons. He wasn’t a very disciplined student, though, and I decided to have him quit until he was old enough to join a band program. Well, band is starting, so it’s time to shine up the old horn! 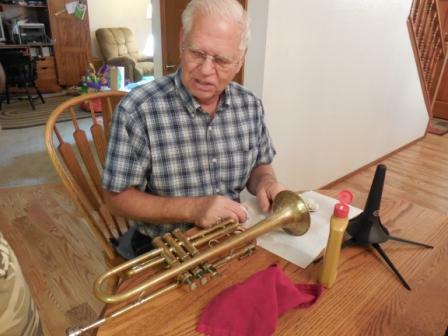 Grandpa M was also a brass player, back in the day, and showed us some tips on getting an old horn into shape. 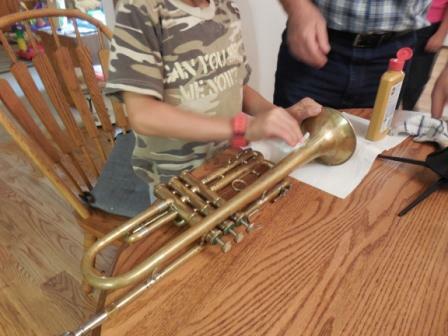 You can shine up a horn with Brasso polish. Who knew? He also solved the problem of the horn not playing. Natter had taken the valves out and re-inserted them in all kinds of weird ways. Fortunately, once the problem was diagnosed, it was an easy fix for Grandpa. Now to see how band goes.